Auriderm XO is a unique Vitamin K Oxide emulsion cream formulated to help bruises look better faster. 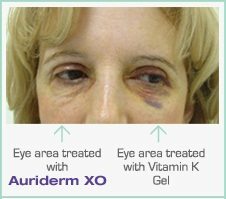 Auriderm XO is used after a surgical operation or to accompany any cosmetic procedure. It is particularly recommended upon laser treatments, and its action is also beneficial upon filling injections, blepharoplasty, facelift and liposuction. It is furthermore effective on rosacea. Vitamin K oxide: strengthens the walls of the blood vessels by limiting their tendency to fragment. •Vitamins C and E: slow down the transformation of the ferrous iron (soluble) responsible for the blue colour into ferric iron (insoluble). Directions: Apply a thin layer of Auriderm XO cream/ emulsion gel twice daily to the required area and rub in gently. Continue to use until the desired results are obtained or use as directed by your Aesthetic Professional. Auriderm XO has a 6 month shelf life once opened. Aqua, alcohol, ethoxydiglycol, caprilyc / capric triglyceride, phytonadione epoxide hexane, propylene glycol, sodiumacrylate / sodium acryloyldimethyl /taurate copolymer, polyisobutene, caprylyl / capryl glucoside, styrene / acrylate copolymer, carbomer, triethanolamine, lecithin, tocopherol, tocopheryl acetate, ascorbyl palmitate, disodium edta.